The Star Cops investigate an unusual kidnapping. Three embryos belonging to the wealthy and influential Madame Assadi (Nitza Saul) are removed from a facility on the Moon. All the evidence (including a genetic fingerprint) points to James Bannerman (Brian Gwaspari) being responsible. He has a watertight alibi though – at the time the crime was committed, Bannerman (a noted concert pianist), was giving a recital at the Royal Albert Hall. After Bannerman is abducted by Madame Assadi he seems fated to suffer a traditional Arab punishment for theft (the loss of his hand). Nathan has discovered the true culprit, but time’s running out to save Bannerman from a life-changing fate …. There’s an awful lot wrong with A Double Life, especially the plot which is so full of holes that it really doesn’t hold up to any sort of close examination. For example, when Nathan hears that the embryos have been stolen he orders an immediate lock-down of Moonbase. This is reasonable, although it’s less clear why he decides to keep two exits open – surely until a thorough search has been completed there should be no movement out of the base? His next bad move is to assign Anna Shoun to guard one of the checkpoints. The mysterious kidnapper is easily able to overpower her and make his escape. Anna is naturally distraught but Colin has no sympathy at all for her – in his eyes she lacks the strength to be a decent officer. Although Theroux and Kenzy react angrily to Colin’s statement, it’s hard not to agree with him – but her failure here is simply laying the ground for the climax of the episode. We later see her team up with Colin to track down the kidnapper and after Colin is captured, she has to save the day. This helps her gain Colin’s respect and cements her place in the team (not the most subtle piece of character development, but it works after a fashion). After the kidnapper had got past Anna, it becomes confusing as to whether he’s still on the Moon or has somehow returned to Earth. Considering how powerful Madame Assadi is, it’s difficult to credit that Krivenko wouldn’t have ordered a complete cessation of travel until the embryos were located (especially since we later learn that both his and Nathan’s jobs might be on the line if a successful resolution isn’t found). A number of ransom demands are broadcast, but the Star Cops are unable to track their location. That is, until the last ten minutes of the episode when Theroux suddenly realises that the signal’s originating from a disused mine on the Moon. Had he twigged this earlier then the episode would have been a lot shorter! The revelation that Bannerman’s father, a noted geneticist, created a clone of Bannerman provides the solution about how he can apparently be in two places at once. His clone brother, Albi, is everything that James Bannerman isn’t – bitter, twisted and poor. Alas, this doesn’t help Bannerman, who never even knew he had a brother, and will be the one to suffer since Madame Assadi is unable to lay her hands on Albi. Although the plotting is more than a little suspect, the major pleasure of the episode is the developing relationship between Nathan and Kenzy. There’s still a slight edge to their conversations, but it lacks the anger of their earliest encounters. And when Nathan travels Earthside to negotiate with Madame Assadi, he decides to take Kenzy with him. They make a marvelously mismatched pair – Nathan is precise and logical, whilst Kenzy is impulsive and emotional. But it’s Kenzy’s approach that works when they are finally granted an audience with Madam Assadi. Nathan’s appeals to see Bannerman are refused and it’s Kenzy’s more direct, angry approach that wins the day. Although Nathan tells her, tongue in cheek, how smooth she was, she did get the job done, which was the main thing. 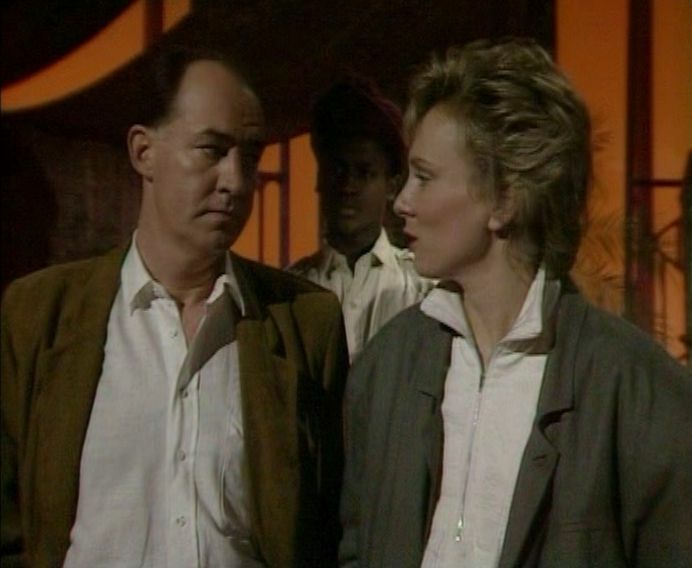 Also of note is her oh-so Eighties dress sense – complete with rolled up sleeves. Maybe by 2027 they will have come back into fashion! The studio-bound nature of the production is another problem. It would be easy to imagine that this was a fairly low-budgeted episode in order to balance out the other, more SFX heavy, ones. Some of the CSO shots – Bannerman performing in the Albert Hall, the outside of Madame Assadi’s mansion – really don’t look convincing. But even though it’s quite flawed, I still can’t regard it as a total write-off. Possibly my affection for Star Cops in general has always meant I’ve cut it some extra slack, but whatever the reason, if you don’t dwell on the plotting and the cheapness of the production there are some good moments to be found.